La Turquie en Europe, ou la Turquie en Europe ou font, les Etats pofedez par les Tures Jusqu en l'An 1690. 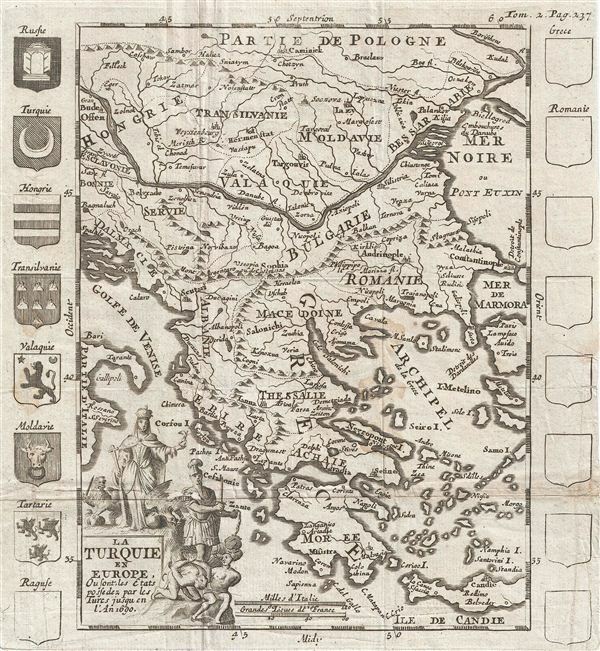 An uncommon c. 1700 map of Greece and the Balkans. Centered on modern day Greece this map covers from Poland to Crete (Candie) and from the Gulf of Venice to the Black Sea, inclusive of Greece, Bulgaria, Romania, Macedonia, Albania, Serbia, and Dalmatia, Moldova, and Transylvania. At the opening of the 18th century most of Greece and the Balkans were under the control of the Ottoman Turks. A decorative title cartouche depicting a Greek Orthodox priest and a Grecian warrior appeasr in the lower left quadrant. Surrounded by sixteen armorial crests, but seven of which but seven have been completed. The empty crests, three of which have been set aside for ‘Raguse,' Greece, and ‘Romanie,' suggest that the cartographer had unrealized plans for this map. It was prepared for Martineau du Plessis' Nouvelle Geographie, published in 1700. Very good. Closed verso repair extending approximatly 2 inch from right center margin. Original fold lines. Blank on verso.